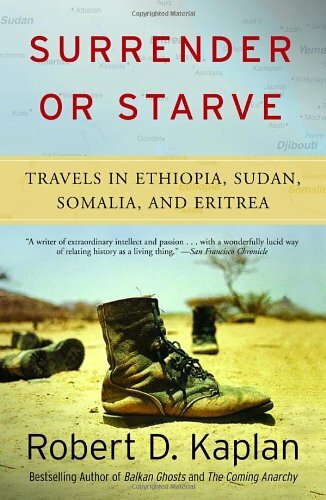 Written in 1988 prior to Eritrea's recognition as an independent nation, Kaplan's first book details how the resultant famine was not as much a result of misfortune or acts of god but rather something created by the Marxist Ethiopian government which can be likened to what occurred in 1930's Ukraine as a result of policies implemented by Stalin. The western media, reluctant to criticise the Ethiopian government for fear of being thrown out of what were considered plum postings, comes in for a fair amount of criticism due to covering the more "scenic" biblical-like famine, rather than the true underlying story of Ethiopia amidst the ongoing resettlement and villagization, which unfortunately continues today. Heavy of facts, figures, dates and acronyms, Surrender or Starve is at times relatively disjointed and occasionally repetitive, but that doesn't detract from the overarching quality of Kaplan's "travel reporting". The writing is very accessible and doesn't shy away from putting forward his own ideas on how events should've been handled (bearing in mind that when written the area was still in a state of upheaval). With frequent references back to other well-known geopolitical events (e.g. the Eritrean guerrilla resistance is compared to the struggle of the Viet Cong against the US and the deaths of the Ethiopian rural people to that of the slaughter of millions of Cambodians by the Khmer Rouge), this is a good book for coming to grips with this part of history and the 2003 published version also benefits from a new foreward and postscript. Overall, Kaplan succeeds in the difficult task of distilling a complex subject into a more easily understood version without dumbing down the content too much. And whilst there are inevitable references back to the US Administrations of the time, which potentially reflect some of his own biases, as a reader we come away much better informed on the history, religions and main ethnic groups of the Horn (and in particular Ethiopia and Eritrea). For this reason alone, it is worth reading Surrender or Starve so as to be either a better informed armchair traveler or actual visitor to this fascinating region.